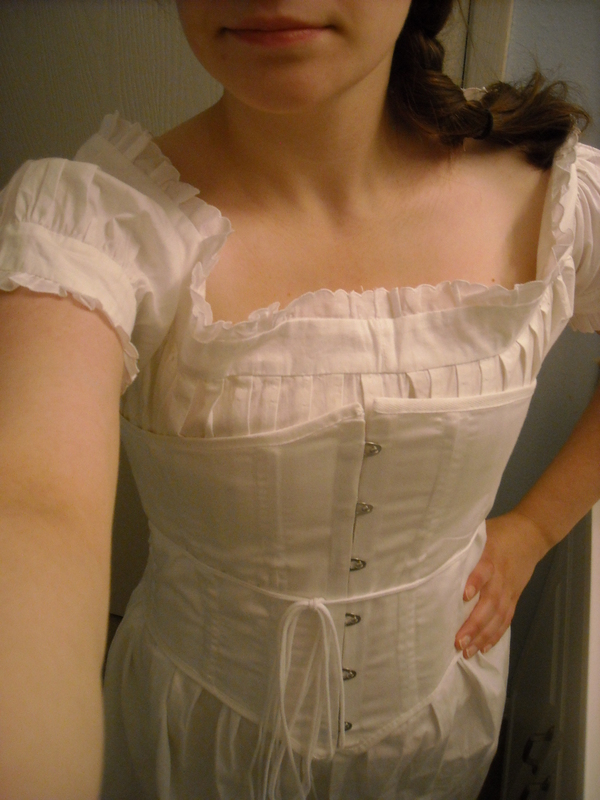 New corset, and off to the reenactment! I seem to be showing you guys a lot of corsetry this week, huh? 😉 Anyways, here are just a few quick photos of the corset I finished yesterday. And no, I didn’t start it this week. 😉 It’s the same one that I was working on last year when I posted this tutorial on how to take a pattern off of a corset. I finally got boning (from a very nice fellow reenactor!) that was the right size to be able to finish it. So, this week I finished it by putting in the remaining boning, inserting the grommets, sewing the twill tape along the edges, and lacing it up. Also, a very big thanks to everyone who offered costume drama suggestions on this post last week! I’m still wading through them, although I did get David Copperfield. However, this week, I mostly sewed while watching my new obsession, Boardwalk Empire. I am just in love with the show’s 20s costumes, and Michael Pitt (who plays Jimmy Darmody) looks *so* much like my ex, that it’s both incredibly entertaining and slightly creepy at the same time. 😉 It was even creepier back in April when Michael Pitt was at the museum on one of my intern days filming a movie, and he sort of gave me this dead-on glare. Anyways . . . . Previous Post The Bastille Day Picnic! Wow, this is so cool! I have to confess, though, that I think Michael Pitt is super scary! So what pattern did you use for the chemise in the photo? I just found your blog and am loving it by the way! Oh, thank you! And I used the Past Patterns chemise pattern for this one.